Playa d'en Bossa, Ibiza. In a central and tranquil part of Playa d’en Bossa, these suites offer a cool and contemporary base right on the beach. Dorado Ibiza Suites - Chic Mediterranean colours of turquoise and gold meet rock and roll in this cool adults-only hotel from the Concept Hotel Group, with dreamy sea views and a fabulous bar. Relax on the elegant pool terrace with its dreambeds and sip on a cold refreshing drink under the Ibiza sun. The beautiful rooftop terrace of the Dorado gives sun, shade and amazing sea views. The onsite bar provides snacks or makes a great location for pre-club drinks. The restaurant of the neighbouring Santos Ibiza Suites is also at your disposal; try one of the many internationally-inspired dishes. All the luminous suites in the Dorado Ibiza Suites provide lots of space and each has a kitchenette with a stylish Marshall-designed fridge to make yourself a fancy cocktail or two. You will feel like pure gold just like the ‘gold' records each Suite is named after. An awesome Marshall sound system, king-size beds to rest on after dancing and a lovely lounge means you can relax to the max. With a full array of events and DJ sets, you have the perfect soundtrack for your holiday. Onsite, Cinerama Dorado offers open-air film showings of top movie classics. 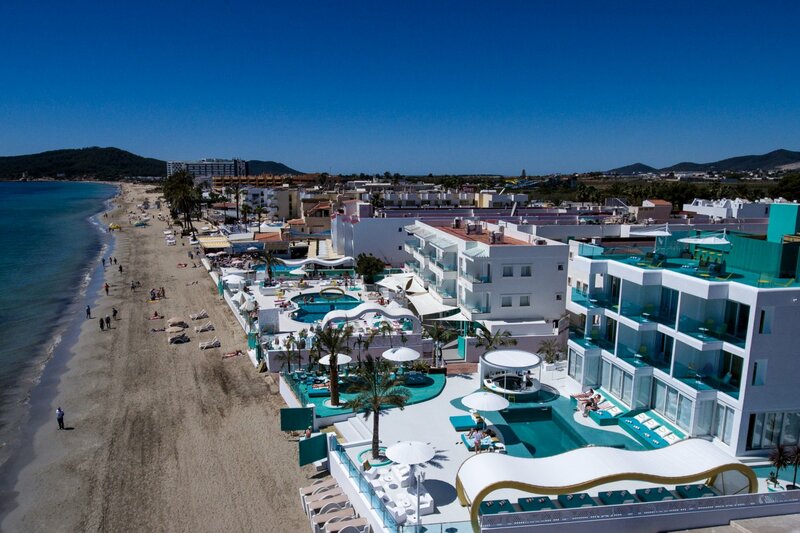 Guests also have full access to the neighbouring Santos Coast Club, with club promoter pre-parties and the popular Dorado Live Shows with well-known bands and singers with an ever-changing line-up throughout the summer. You can also have your own private after party of all shapes and sizes in one of the Club's special areas. Right in the centre of Playa d'en Bossa, the Dorado Ibiza Suites offer the perfect tranquil oasis to relax after those legendary Ibiza nights. Impeccably placed right next to the famous long sandy beach, you are only a short stroll away from a fabulous selection of beach clubs, bars and restaurants. Super-clubs like Hï Ibiza, Ushuaïa and Sankeys are also quickly reached on foot and you also have the chic and cosmopolitan nightlife of Ibiza Town, just a short bus or taxi ride away. Visit also the other hotels of the Concept Hotel Group in Playa d'en Bossa, the Santos Ibiza Suites right next door and the Tropicana Ibiza Suites. And brand new since 2018 we bring you the Paradiso Ibiza Art Hotel in the Bay of San Antonio and the Cubanito Ibiza Suites in the beautiful bay of Cala Gració near San Antonio.